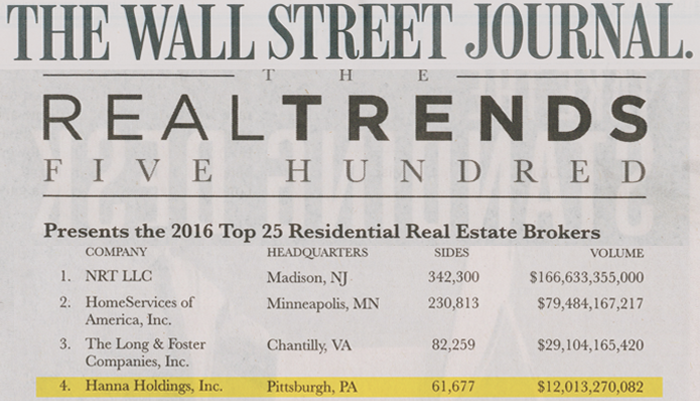 Pittsburgh, PA (April 27, 2016) – Howard Hanna Real Estate Services continues its rank as the 4th largest real estate organization in the United States based on home sales in 2015. Howard Hanna closed 61,677 transactions last year with a volume of over $12 billion, an increase of 28% over 2014, ranking the family-owned and operated company as the 4th largest in the country in the annual REAL Trends 500 rankings report and RISMedia’s Power Broker Report. This increase was the greatest of the top companies ranked. Howard Hanna closed $12 billion in property sales volume in 2015, a 28% increase over 2014. Both the REAL Trends 500 and the RIS Media Power Broker reports rank the 500 largest real estate brokerages in the United States. These power brokers reported a collective $1,123,494,913,023 in sales volume and 3,453,108 transactions. This represents more than a $150 billion increase in sales volume over 2014, and nearly 250,000 more transactions. REAL TRENDS has been the trusted source for news, analysis and information about the residential real estate industry since 1987. RISMedia was founded in 1980 as the residential real estate industry’s definitive source for news and information.